Sometimes it isn’t easy following a legend especially if it’s your father. Eugene “Cyclone” Hart was one of if not the hardest hitting fighters to ever come out of Philadelphia scoring knockouts in his first 19 fights and 28 in his 30 wins. Jesse “Hollywood” Hart grew up in North Philadelphia and won the National Golden Gloves in 2011 along with winning the US Nationals. He entered the 165 lb. 2012 Olympic Trials with an 81-10 record and was on the USA team. Hart was given four tough opponents in order to reach the finals in the Trials. First up was southpaw Chris “Sweet Pea” Pearson, 93-7, (13-2-1 as a pro) from Ohio who Hart defeated 18-6. 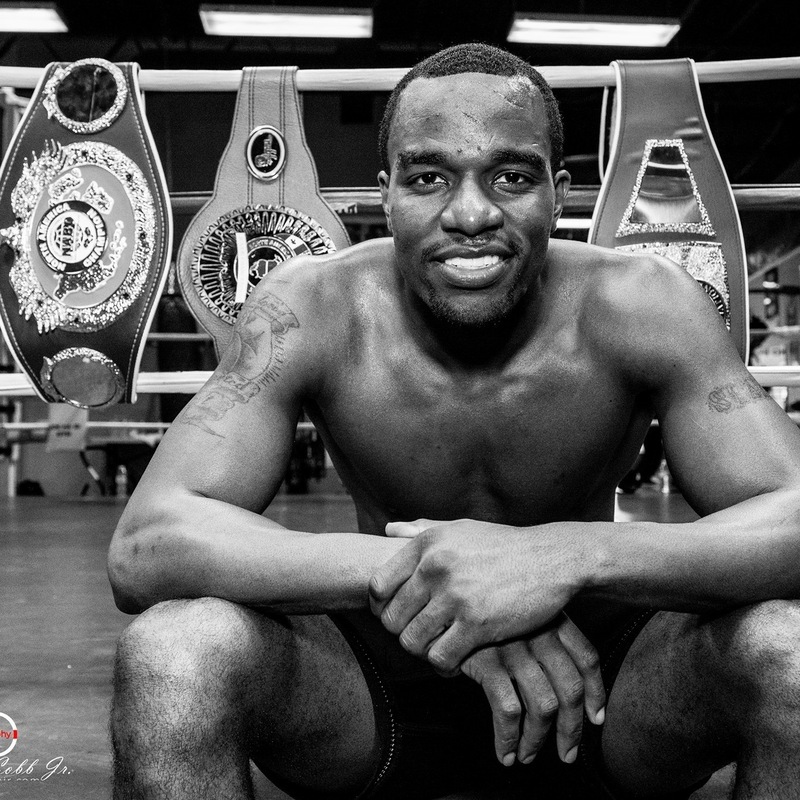 Next up was D’Mitrius Ballard (18-0 as a pro) from Temple Hills, MD, who was the 2012 National Golden Gloves champion. Hart defeated him 20-8. Then came Antoine “Action” Douglas from Burke, VA, who had 120 amateur bouts (22-2-1 as a pro) who Hart defeated 14-8. In the semi-final Hart fought Luis Arias (18-1 as a pro) of Milwaukee, WI, who won the 2010 US Nationals against Hart 4-4 and Arias was given the win. He was 140-24 but was no match for Hart losing 21-6. In the final Hart faced Terrell Gausha (20-1 as a pro) of Cleveland, OH, who Hart lost to in the 2009 US Nationals final. Gausha had gone to Brazil and won Gold in the 2012 Americas Olympic Qualifier in order to qualify for the Olympic Trials. The final ended up 10-10 (34-34 count back; 3-2 vote) and given to Gausha. This writer felt that decision was unfair to Hart who was already the USA Team member and should have gotten to go to the Olympics. He ended up as the Olympic Alternate to Gausha who went and lost in the second round. As a pro he dropped to 154 losing in an October 2017 title fight to Cuban Erislandy Lara the WBA Super World champion and hasn’t fought since. Hart felt he had something to prove in the professional ranks after getting side stepped in the Olympic Trials. He left Northern Michigan University where his coach was Al Mitchell from Philadelphia and returned to his roots in Philadelphia. He split his time between returning to his old coach Fred Jenkins at the ABC Rec Center Gym at 26th & Masters in North Philadelphia along with his father Eugene “Cyclone” Hart, at the Joe Hand Gym in South Philadelphia. They co-train Hart. Hart signed a co-manager contract with Doc Nowicki and Dave Price and signed a promotional contract with Top Rank. He turned professional in June of 2012 at the MGM Grand in Las Vegas, NV, scoring a first round stoppage. Then three more stoppages followed going into December of 2012. Hart at 6:03 has the physique to be a light heavyweight like a past champion named Bob Foster. In Hart’s fifth fight which was his first in Philadelphia at Temple University’s Mc Gonigle Hall he met up with a spoiler named Steven Tyner, 3-8-2, who had fought ten unbeaten opponents up until then with the last five unbeaten. Hart dropped Tyner in the first round and went on to win an easy 40-34, 40-35 twice four round decision. Six of Hart’s next seven fights were six rounder’s with one four. He won six of those seven by stoppage. Top Ranks Bob Arum knew he had a future champion in Hart. Matchmaker Brad Goodman was matching Hart in a way a boxer should in order to get to a championship. Hart was 12-0 with ten stoppages and ready for his first eight rounder. He had fought in Atlantic City, NJ, three times but still only once in Philadelphia. “I have worked with Jesse from the time he turned professional with Top Rank. It’s doubtful Ramirez would give him a rematch. Jesse is willing to fight anyone even if it means going across the pond to the UK (and fight George Groves or Rock Fielding who hold the WBA titles). With a win over Mike Gravonski (who is No. 11 in the WBA) on August 18th he will enter their ratings. WBC champ David Benavidez is fighting (No. 2) Anthony “The Dog” Dirrell (former WBC World champion). Then there is the other Mexican champion Jose “Bolivita” Uzcategui who holds the IBF title (who defeated Anthony “The Resurrected” Dirrell’s brother Andre in March reversing a loss in their previous fight by DQ. No. 1 is vacant and No. 2 is Caleb “Sweethands” Plant who may be getting the next title fight. Hart is only ranked No. 10 in the June ratings with no July ratings shown),” said Goodman. 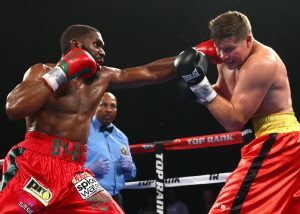 Hart was matched with southpaw Samuel Clarkson, 10-2 (currently 21-4 as a pro) from Cedar Hill, TX, at the Mandalay Bay Resort & Casino, in Las Vegas. He was a former 2-time Texas Golden Glove champion and a PAL National champion at 175. This bout would be for the NABF Junior Super Middleweight title. Hart had Clarkson down twice in the fourth round and won all three cards of the judges 80-72. Clarkson would go onto win his next nine fights before losing to current unbeaten WBA World Light Heavyweight champion Dmitry Bivol for the interim title. Hart would post two stoppages in Atlantic City before returning to Philadelphia to stop Samuel Miller, 28-9, in the second round at the 2300 Arena in South Philadelphia. In May of 2015 in his first ten rounder he fought for the vacant USBA title against unbeaten Mike Jimenez, 17-0, out of Chicago. The winner would automatically go into the IBF rankings. The vacant WBO NABO title was also on the line which meant going into the WBO rankings for the winner. Hart stopped Jimenez in the sixth round to enter both the IBF and WBO rankings. Next up for Hart in September in Las Vegas would be the son of legendary Hall of Fame boxer Aaron “The Hawk” Pryor’s son Aaron, Jr. 19-8-1, at 6:04 out of Cincinnati, OH. Hart would stop Pryor in the ninth round. At the end of 2015 Hart was dropped back to an eight rounder in a “keep busy” fight scoring a first round stoppage in Tucson, AZ. Hart received a right eye laceration in this bout. In March of 2016 Hart would return to the 2300 Arena in South Philadelphia against another “spoiler” in Dashon “Fly Boy” Johnson, 19-18-3, of Escondido, CA, who had won his last four bouts, including reversing a loss to Mike Gavronski, then 20-1-1. Hart found himself hitting the canvas in the tenth and final round to the shock of the crowd and writers. He got up like a champion should and went onto win by scores of 98-91, 97-92 and 95-94. This was the kind of fight Hart needed to develop on his way to a championship fight. Due to a hand injury suffered in his last bout Hart would be out of action for eight months before returning to the ring in Las Vegas to meet Andrew “Hurricane” Hernandez 16-4-1, at the Treasure Island Casino. Hernandez was on a six fight win streak including defeating Russian Arif “The Predator” Magomedov, 17-0, who two fights prior to this defeated Hart’s stablemate Derrick “Take It to The Bank” Webster, 19-0, even dropping him in the tenth round. Webster would move up to super middleweight after this fight obviously too light to be a middleweight at 6:04. Hart stopped Hernandez in the third round. 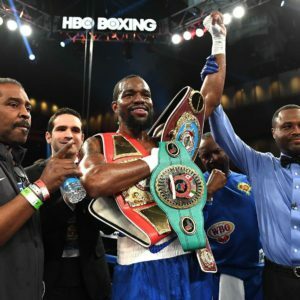 In April of 2017 Hart would defend his USBA and WBO NABO titles taking on Mexico’s Alan “Amenaza” Campa, 16-2, at the MGM National Harbor in Oxon Hill, MD. Hart went onto stop Campa in the fifth round. This win set up a world title fight with WBO World Super Middleweight champion Mexico’s southpaw Gilberto “Zurdo” Ramirez, 35-0 (24). The bout was held at the Convention Center in Tucson, AZ, in September of 2017. Ramirez’s promoter was also Top Rank. Hart’s manager’s contract ran out prior to the title fight and he decided not to resign with Nowicki and Price. “I had nothing derogative to say about either Doc or Dave. I just wanted to be my own manager. I have a solid partner in Steven Andrews. He is a real good business partner of mine. He’s one who can plan my future for me,” said Hart. In talking with Steven Andrews you knew instantly he knows his boxing. “I have been with Jesse since he was sixteen years old. I have films that no one else has going back to those times in the amateurs. The Jesse you saw in the Ramirez fight was not the Jesse I know. Not having a tall southpaw like Webster to spar with hurt Jesse. He wouldn’t return our phone calls after committing himself and never showed up in camp. Jesse will be champ no matter whose holding the title,” said Andrews. Hart was 22-0 with 18 stoppages. In the second round Hart was knocked down. At the end of the fight it would play a major part in the scoring. It was a close well fought battle with Ramirez retaining his title by scores of 114-113 and 115-112 twice. Hart wanted a rematch with Ramirez but he was told he would not be given one by the Ramirez management. Both fighters would return to the ring in February of 2018. Hart came in at his highest weight of his career at 173¼ and it had some of us writers wondering if he was moving up to light heavyweight. His opponent would be Thomas “Awin” Awimbono, 25-7, of Accra, GH, living in the Bronx, NY, and weighing 179½ and a full fledge light heavyweight. A year before Awinbono had gone the distance with Webster and unbeaten Caleb “Sweethands” Plant. Hart wasted no time in taking out Awimbono in 1:28 of the first round. Just two months later Hart returned to the ring taking on Demond “D’bestatit” Nicholson, 18-2, from Laurel, MD. Among his opponents he fought to a draw with Immanuwel Aleem, then 16-0. Hart returned to a super middleweight 167½. It was held at the Liacouras Center of Temple University in Philadelphia for the vacant NABF title. Hart would stop Nicholson in the seventh round. Hart is scheduled to fight on August 18th at the new Ocean Resort Casino in Atlantic City, NJ, taking on the No. 11 WBA ranked Mike Gavronski, 24-2-1, in a NABF title defense with the hope of entering the WBA rankings. KEN HISSNER: Going back to your amateur days I remember seeing you in New York’s China town with the USA Team against the Chinese team. You were very impressive in winning your bout but Fred Jenkins or your father were not in the corner. Why was that? JESSE HART: They (USA Team) pick the team coach and my father and Fred were not part of that team. KEN HISSNER: The most impressive boxer on the Chinese team was Fanlong Meng who is now 13-0 (8), as a light heavyweight. Remember seeing him? JESSE HART: I sparred him and had no problem with him. I think he has to come to the US in order to develop. KEN HISSNER: In the amateurs I also saw you in one of your two bouts defeating Derrick Webster in a Philly tournament. As professionals the two of you ended up under the same management. I once did an article that the two of you were on a collision course. He was 38-2 in the amateurs only losing to you twice. Since you left that management has a bout with Webster ever been offered to either of you? 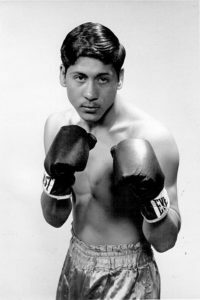 KEN HISSNER: When you were training for the Ramirez title bout was Webster one of the people being a southpaw you used for sparring? JESSE HART: Derrick agreed to help me prepare for Ramirez but everyone in Top Rank and even myself left messages but he never returned any of our calls. KEN HISSNER: How has it been working with Brad Goodman of Top Rank being he is matching your opponents for you? JESSE HART: He’s done a great job with my career. He knows what fights to get me better for my career. KEN HISSNER: Of your 25 fights you have only fought in Philadelphia 4 times. Do you wish to have fought at home more? JESSE HART: Yeah, but no. I don’t want to get that home mentality. I enjoy fighting in other areas. KEN HISSNER: I understand the Ramirez camp is not willing to give you a rematch though you are still the No. 1 contender in the WBO. He recently in June defended against an opponent who is no longer in their ratings. The WBA champ George Groves is defending against Callum “Mundo” Smith and like you neither for some reason are in the WBA rankings. Is there another one of the champions that you have your eye on fighting? JESSE HART: I’m No. 3 in the WBC. I would like to fight (WBC champion) David Benavidez but I think he has another opponent. KEN HISSNER: WBC champion David Benavidez has a September 8th defense planned but with no opponent mentioned at this time. Smith is ranked No. 1 and you are No. 3 in the WBC. With Smith fighting Groves and you fighting three weeks before that it’s certain neither of you will be getting that title shot. Was fighting Benavidez ever offered to you? JESSE HART: Yes, Top Rank were about to sign him but when they didn’t it fell through. KEN HISSNER: In your division two of the champions are from the UK and two from Mexico with one from the US. Your promoter Top Rank may be the one of or the best promoter in the world. Do you have much interaction with Bob Arum? JESSE HART: I talk to him and is a friend of the family. I can go to him direct. I’ve sat down with him in his home. KEN HISSNER: You have a very outgoing personality which I believe is a plus for your career. Besides your father have you had or now have any boxers you admire? JESSE HART: “Sugar” Ray Robinson and Muhammad Ali. Ali was one that I admired the way he handled himself. Sacrifice now while I am young in my training and everyday life and I can live the rest of my career as champion. KEN HISSNER: In your upcoming fight with Mike Gavronski who is No. 11 in the WBA rankings have you seen any films of him? JESSE HART: I’ve seen a couple of films with Hendricks and Johnson. If I shows any kind of weakness he will press forward. KEN HISSNER: With a win over Gavronski you should get into the WBA rankings. With both Groves and Fielding as the WBA champions and from the UK would you be willing to go over there if the opportunity was offered to you? JESSE HART: Absolutely I would love to go over there. I saw Errol Spence go over there. I don’t care where I fight him. I come to shut the man down that I fight! KEN HISSNER: I want to take the time to thank you for taking the time to answer questions and with one more question are you going by “Hard Work” or “Hollywood? JESSE HART: I changed from “Hard Work” to “Hollywood” prior to the Ramirez fight which was recommended to me to add more flair. So that is what I am keeping. I want to thank you Ken for doing this for me. On the eve of Philadelphia’s No. 1 WBO Contender Jesse “Hard Work” Hart’s world title challenge his former manager Dave Price spoke out to this writer. I put out a story prematurely before getting a response from Price knowing the two may have not been on speaking terms. 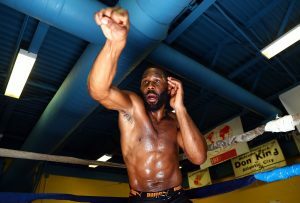 Price is a Philadelphia pastor who ran many amateur shows mainly at the 57th & Haverford Recreation Center where Mitch Allen runs the gymnasium and where his great grandson Damon Allen, 13-0-1 who is signed with Golden Boy Promotions trains. When Hart turned professional Price and Doc Nowicki teamed up creating D&D Management. Price was the manager and Nowicki the promoter of record though they went to Top Rank to handle Hart’s main business. Word was Philly PPV promoter Joe Hand, Sr. had been offered a piece of the action but turned it down. Hart goes between Hand’s gym where his father Eugene “Cyclone” Hart the former knockout artist trains him. For the record this writer has been barred since day one from Hand’s gym. Hart also has main trainer Fred Jenkins, Sr., who runs the gym at 26th & Master’s Recreation Center in the corner. Jenkins is a well-respected person and trainer and recent PA BHOF inductee. Being told from an undisclosed source Price and Hart were not on speaking terms anymore I failed to get an opinion from Price which was this writer’s error. When I had my article on Hart already submitted Price got back to me and said he had sent a comment that I failed to put up which was true. Price had this to say about Hart: We are very disappointed Jesse Hart did not choose to resign with us. We (Nowicki) guided him for his entire professional career point but nothing lasts forever. We were scheduled to have this fight in June of 2016 and Ramirez (WBO super middleweight champion) withdrew. 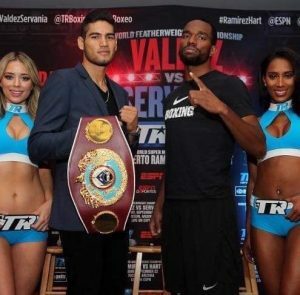 I think this, Jesse and his team have devised a great game plan and he will show he is head and shoulders above the skill level of Gilberto Ramirez (WBO Super middleweight champion). If he is able to win this fight and with the departure of Andre Ward and a much improved Badu Jack, Jesse will be poised to become a super star in the middleweight division. Philly’s Jesse Hart a No. 1 WBO Super Middleweight Contender Awaiting His Turn at Title Fight! Philly’s Jesse Hart No. 1 WBO Super Middleweight Contender Awaiting His Turn at Title Fight! The No. 1 WBO Super Middleweight contender Jesse “Hard Work” Hart, 21-0 (17), comes from a boxing blood line following in his father Eugene “Cyclone” Harts, 30-9-1 (28) legacy in Philadelphia! The elder Hart won his first nineteen bouts by knockout! In his twenty-second fight he fought Denny Moyer and both fell out of the ring and ruled a No Contest in 6 rounds. Moyer was knocked down in the first round. 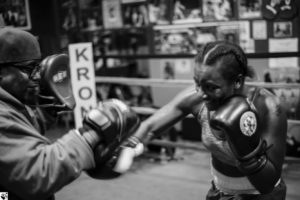 When the son of the “Cyclone” turned professional in June of 2012 the concern of this writer was he would try to top that knockout record of his father instead of using all of his boxing skills. His knockout streak was stopped after his fourth fight fortunately. In a rematch he stopped that opponent. He has worked his way to rankings in the WBA No. 10, IBF No. 5 and WBC No. 13 besides the top ranking in the WBO a title held by Mexico’s Gilbert “Zurdo” Ramirez, 30-0 (24), who won the title in April of 2016 winning all twelve rounds over champion Arthur Abraham, 44-4 in Las Vegas, NV. Southpaw Ramirez has not defended his title going on a year. He recently suffered a hand injury and was to fight on the Pacquaio-Horn card per Top Rank Promotions who represents both Ramirez and Hart. Ramirez didn’t fight in the US until 2013. His last eight bouts have been in the US except for one in China winning the NABF title over Australian Junior Talipeau in 2014. Winning the North American Boxing Federation title against an Australian in China? Go figure! Hart won the 2011 Golden Gloves title qualifying him for the 2012 Olympic Team. He went to Europe and lost in quarter finals. So upon his return in the Boxing Trials he won his first four matches before meeting Terrell Gausha whom he lost to in the 2009 GG finals by DQ in the 3rd round. The bout in the 2012 Trials ended 10-10, 34-34 count back with Gausha getting the 3-2 vote from the officials. Gausha would win his first bout in the 2012 Olympics in London before losing his next bout against a boxer from India. It is this writers opinion at 6:03 Hart would have been a better choice of the voters to represent the USA team. Gausha is out of Cleveland, OH, and 16-0 (9) as a professional. In the Trials Hart defeated four boxers who are all now professionals. First Chris Pearson, 14-1 (10), of Trotwood, OH, d’Mitrius Ballard, 15-0 (11), of Temple Hills, MD, Antonine Douglas, 19-1-1 (13), Burke, VA, and Luis Arias, 16-0 (8), Milwaukee, WI, who holds the USBA middleweight title. That is quite a line-up of boxers Hart had defeated to get to the finals. Hart was signed to a manager’s contract in July of 2014 with Dave Price and promotional contract with “Doc” Nowicki and Top Rank. They also have Derrick “Take it to the Bank” Webster, 22-1 (11), of Glassboro, NJ. His record was 38-2 in the amateurs losing to Hart twice. KEN HISSNER: I’ve known you for some time. The first time I saw you box is when you defeated Derrick Webster in an amateur tournament in Philly. I also saw you in New York win against a team from China. I believe your father and Fred Jenkins, Sr. train you now. Didn’t Chip Hart train you for a time in the amateurs? JESSE HART: Yes my brother did train me for some time. I then went to Northern Michigan where I trained with Al Mitchell at the Olympic Development Center. KEN HISSNER: I knew you spent time at the Northern Michigan University under Philadelphia’s Al Mitchell. How was it living away from home? JESSE HART: Living away from was good in the sense it was like being in camp full time. I didn’t have the distraction of the street life and all it brings. KEN HISSNER: I believe you divide your training between two gyms in Philly, the ABC Rec Center and Joe Hand’s Gym. Do you go away to a training camp for a bout and if yes where? JESSE HART: Yes I train between ABC with Fred Jenkins and at Joe Hand’s with Danny Davis. Both trainers bring a uniqueness to their approach. Fred is an old school technician and disciplined boxing trainer but Danny brings his own style of modern pad work, strength work and he is an excellent wrapper of hands. I generally hold my camps at home but I have had camps where I physically left my home and stayed off site, trained at Joe Hand’s or ABC and then returned with my team to a selected location. KEN HISSNER: What were your feelings when you fought Terrell Gausha in the Olympic Trials to a 10-10 decision and were not chosen for the 2012 USA Olympic team? KEN HISSNER: I know you had a hand injury operated on. How is that hand at this time? JESSE HART: My hand is 100%. I have a great surgeon who did a great job and I have fought since then with no problems. KEN HISSNER: You are ranked No. 1 in the WBO. Have you seen the WBO champion Ramirez and if yes what is your opinion of him? JESSE HART: Ramirez is a good fighter maybe even very good but he hasn’t fought the likes of Jesse Hart. I love that fight for Top rank, my fans and my team. That’s when the world will see that I am a bonafide super star. KEN HISSNER: Do you have a time table when you want to fight for the WBO title if not now? JESSE HART: I wanted to fight Ramirez in January of 2017. My management team contacted me and told me it should happen and I was hurt it didn’t but not really surprised. Ramirez wants to hold onto that title as long as he can. KEN HISSNER: In your last seven fights only Dashon Johnson has gone the distance with you in Philly. There was talk of a rematch. Is that still in the works? 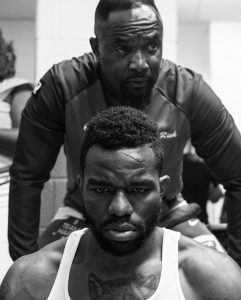 JESSE HART: Dashon Johnson was a good tough opponent and it goes to show you that when people fight Jesse Hart they train like they never done before. He came to fight, fought and lost. He gave it all against the champ and came up short. This Isn’t Rocky or the movie creed. You have to earn your shots at the champ. I don’t know maybe if his real name was Mayweather or Ward we could build another fight around that. KEN HISSNER: WBC champion Badou Jack after drawing with IBF champion James DeGale vacated his title to move up to light heavyweight. Did you see the fight and if you did being ranked No. 5 in the IBF would you like to fight DeGale for his title? JESSE HART: I would love to fight DeGale. Man I really wanted to fight Jack but he moved up. Anyone at 168lbs can get it and once I run through this super middleweight division who knows. KEN HISSNER: I want to thank you for taking the time to answer these questions. It’s always a pleasure to talk to you. JESSE HART: I would like to thank all the fans, Bob Arum, Top Rank, my management team Doc Nowicki and Dave Price and Team Hart: Cyclone, Fred Jenkins, Danny Davis, Hundew McDonald and slick Rick. ​Eight Division world champion Manny Pacquiao has begun training for his November 5th fight against WBO Welterweight champion Jesse Vargas. Pacquiao, who is a current Senator in the Philippines, will be training exclusively in his native country, as to not interrupt his public duty. The 37 year old is coming off of a Unanimous Decision victory over Timothy Bradley Jr. in April. It was his best showing against Bradley, who he fought three times, but many concerns have been starting to arise with Pacquiao’s overall look as he trains alongside being a new member to the senate. “I think he is getting a little tired. He looked a little flat. Pacquiao is sparring exclusively with Jose Ramirez, an undefeated up and coming fighter in the Top Rank stable. 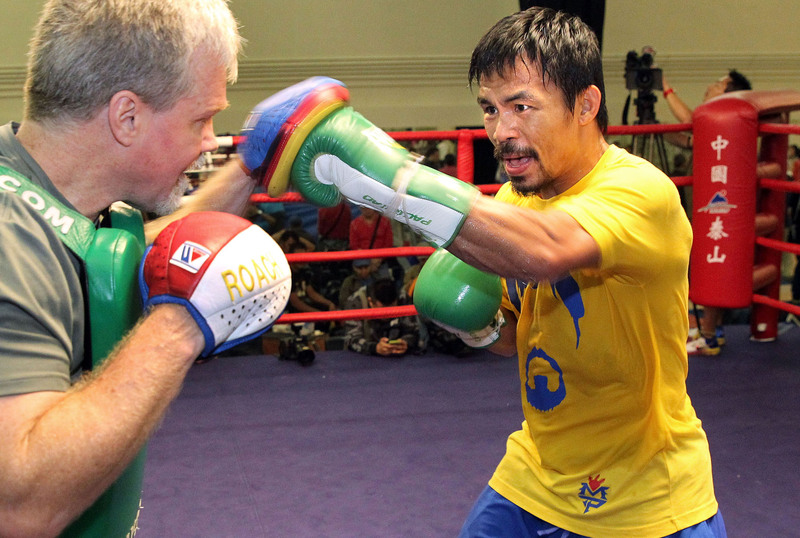 Ramirez agreed with Roach, in Pacquiao looking less than stellar in their recent training preparations. Is Pacquiao just too tired to compete as a top level boxer with his new duties as a senator or has age finally caught up to the legendary fighter? 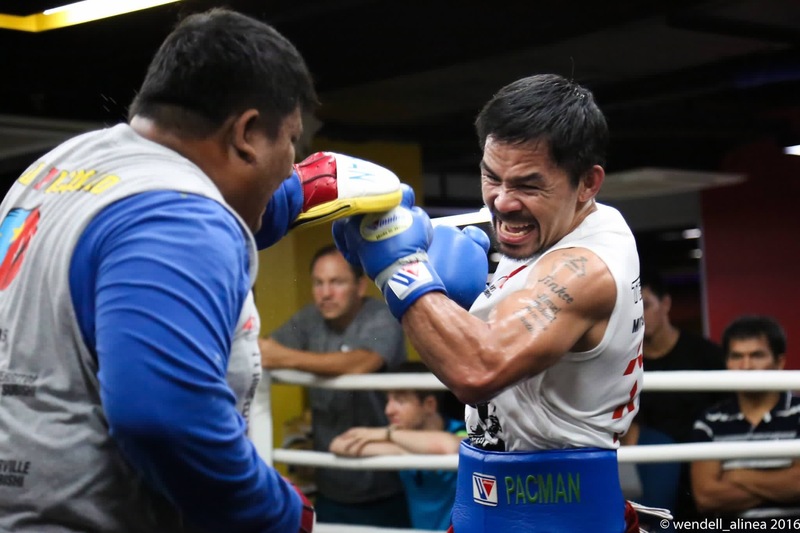 ​Videos were released yesterday of Pacquiao training on heavy and double-end bags, and most people saw a very different Manny than the one that Roach was describing a few days earlier. Pacquiao seemed to be his old self, moving quickly in and out and flashing the speed and powerful hands that have made him a force in the boxing world for the last decade. ​Eventually every boxer slows down, and Pacquiao may just be doing that. Working a full day as a Senator and then going to train for a top level boxing match at night would be almost impossible for any other person. But this is Manny Pacquiao and I believe we give him the benefit of the doubt until we see otherwise. His retirement was less than 3 months, and he will still have fought more times this year than other champions in the same weight class who are almost ten years younger than him. Time will tell, and we hope that the Pacquiao of Old is still inside this Old Pacquiao. ​It is official, Manny Pacquiao is no longer retired. Pacquiao, who said he was leaving the sport after beating Timothy Bradley earlier this year has an official fight date of November 5th against WBO welterweight champion Jessie Vargas. ​Pacquiao’s longtime adviser Michael Koncz told the LA Times “Retirement doesn’t suit Manny right now…Boxing is in his Blood.” Pacquiao, who has since become a Senator in his native Philippines is fighting for the 2nd time this year, which is more than almost any other major fighter in the sport today. Which doesn’t really even make this a comeback or a retirement. ​Many suitors were in the mix for this fight. Four time division champion Adrien Broner was said to have priced himself out. Newly crowned lineal Jr. Welterweight champion Terrence Crawford seemed to be the top guy for the fight, until Pacquiao’s trainer Freddie Roach spoke up about not wanting his man to fight Crawford, claiming that Manny would not be at 100%, since a majority of this camp would take place in the Philippines and take place around and after Pacquiaos senatorial duties. ​Now the question comes into play, why did Manny even make this announcement of retirement. He is still on his normal schedule of fighting twice a year. He will take a pay cut from his normal $20+ million dollar payday from Arum. The fact that this is a Pay per view fight is another issue that people are taking up arms about. After a ppv of Algieri, Rios, and Bradley 3 all doing worse and worse, how can Top Rank look to make money on this fight? ​Here is the point. Pacquiao is 37 and still one of the best in the division. He beat the brakes off Bradley for a third time only a few months ago. Most likely he will be a big favorite in this fight against Vargas and win another major title in the welterweight division. The end game is most likely a rematch with Mayweather in May of 2017, but, why Mayweather would take on an active Pacquiao after two years out of the game, with no tune up fights. Sure a lot of money will be on the table, but so will Mayweathers undefeated record, and a 50th win at that. ​This is both a lead up to fight Crawford next year and set up Top Ranks new star. The Pay per view game is not doing well. 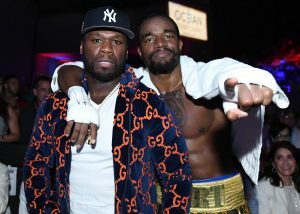 The era of the Mayweather and Pacquiao paydays are over, but promoters still need to find the cash cows to keep them in the black, and Crawford may have been passed this time around, to set up his future next spring.